Tired of software, longing for the touch and feel of circuits, I’ve been looking for something to satiate my sonic hunger. And, I wanted to get my hands dirty. So, I placed a small order of electronic parts with mouser.com. 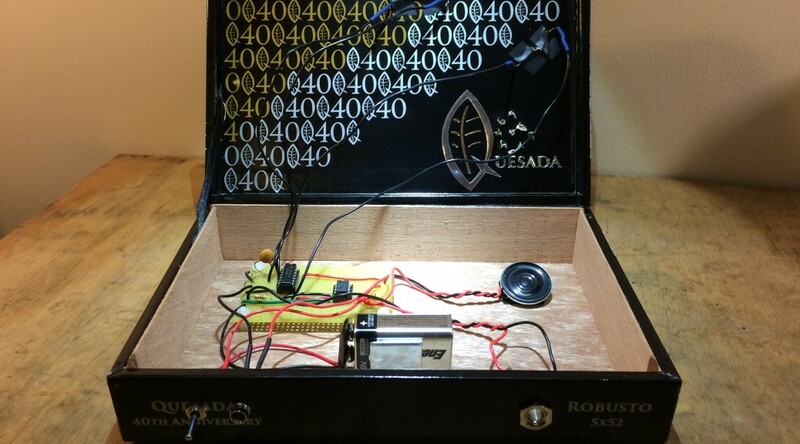 Additionally, ever since having discovered that the cigar store in Staunton, VA sells nice wooden cigar boxes between $3 and $5 (size and quality), I’ve been itching to put a nice piece of analog circuitry inside. p.161), I found a nice schematic on controlling pitch and volume with photo-resistors. (note: instead of throwing up the schematic as an image, I have posted a pic of my breadboard circuit based upon his schematic below. Regardless, I urge you to support Nic by buying his book. It’s really good). After wiring the circuit up on a bread-board, I noticed how quiet the theremin sounded. 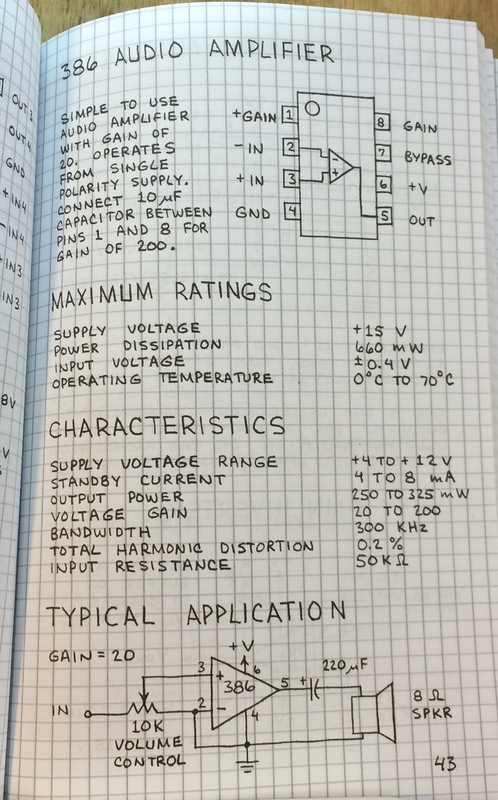 To boost the signal, I needed an audio amplifier, so I turned to the good, old Radioshack project book, Timer Op Amp and Optoelectronic Circuits and Projects Vol. 1 (p.43). Forrest Mims is completely straight-forward on schematic, use, and example. Forrest Mims diagram for the 386 audio amplifier (another must-have book for audio applications). Taking the output of the photo-resistor theremin into the 386 seriously boosted the audio signal, even though I did not have any 220uF capacitors (as shown above). Later, I learned from talking with University of Virginia’s Tech Director, Travis Thatcher, that the capacitor on the output signal is to remove any DC offset that could damage the speaker. A 10uF cap would work fine, or the 220uF as shown. While no capacitor worked for me on this project, I did add a 220uF cap to my parts list for next time. Above is the circuit. The top, 14 position IC circuit is a Hex Schmitt trigger, which is used as the oscillator. The 10k photo-resistor on positions 1 and 2 control pitch, while the other resistor controls volume (one could use a potentiometer instead of a photo-resistor for either control). The audio outs feed into the smaller, 8 position, 386 amplifier. Everything is driven on a 9V battery. 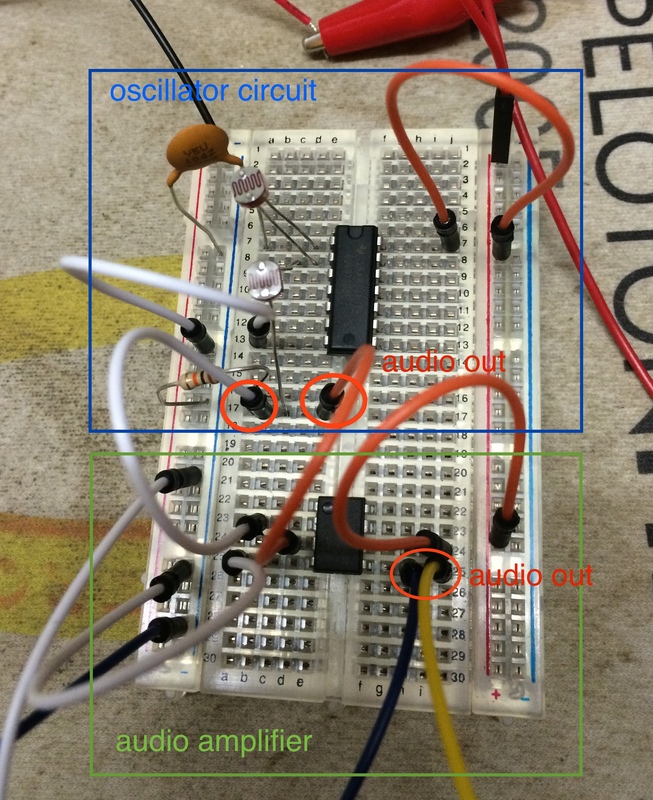 What is not shown in the breadboard schematic above are three simple, but useful additions. I added an on/off switch for power, a LED indicator light, and a mono audio jack output for sending the signal to an amplifier (e.g. guitar amp). Since this was my first project using a power switch, I scoured the internet on wiring and definitions. I learned a lot from this SparkFun article on switches. Transferring bread board to soldered circuit board. 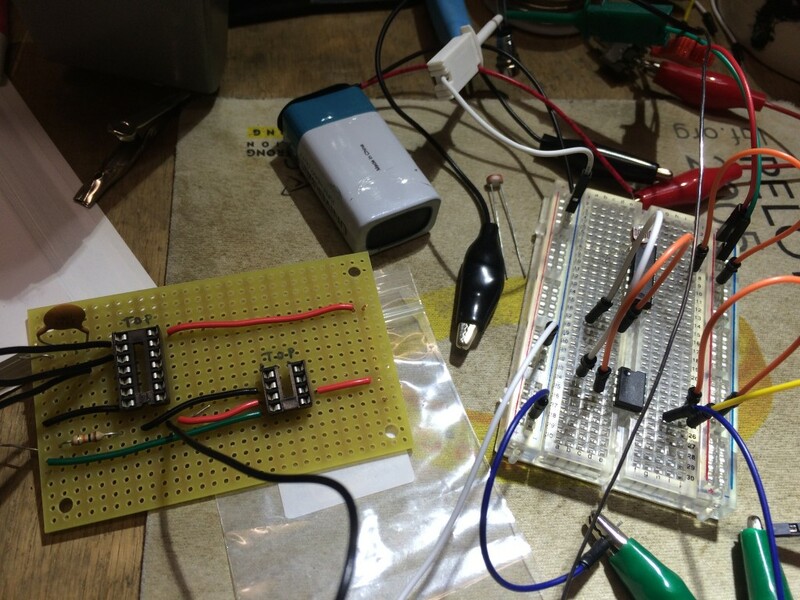 While the breadboard took less than ten minutes, the soldering transfer took a few hours… yes, I am slow. “Measure twice, cut once”, thank you Grandpa Overholt. Methodical work can have its benefits, however (no re-soldering on this job!). 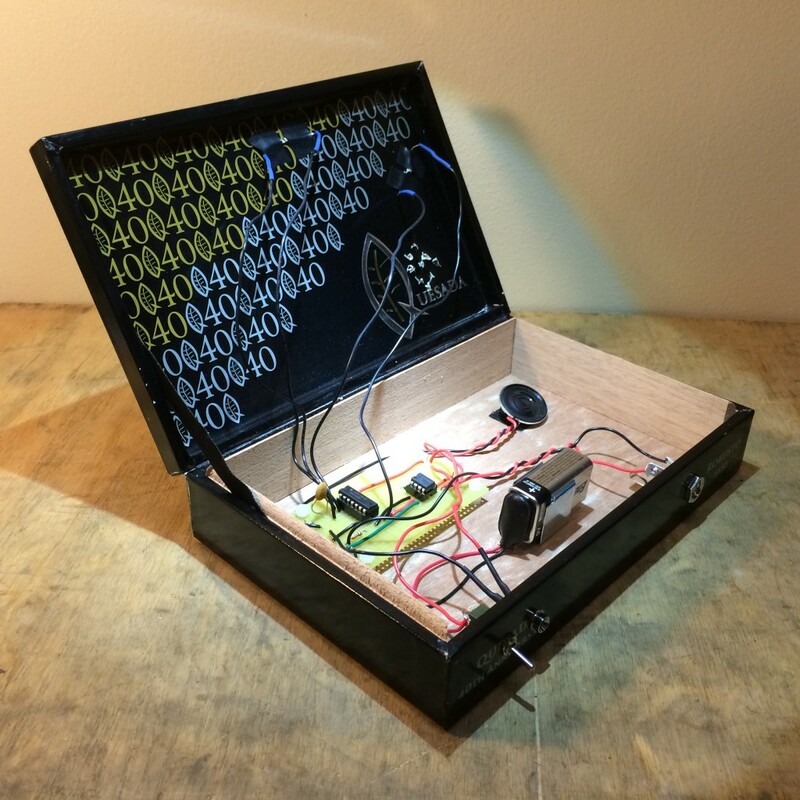 After completing the circuit board, I set the board on stand-offs in the cigar box. 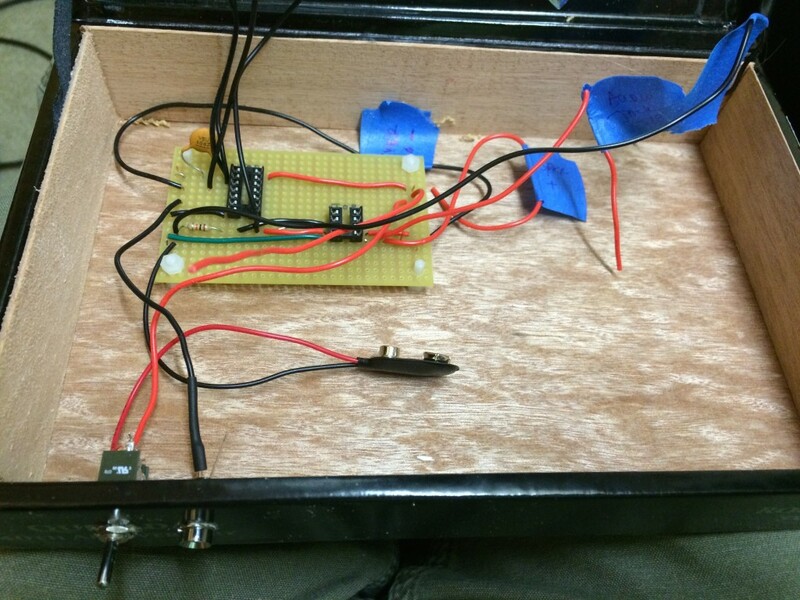 Partially complete cigar box instrument. to be a great tool, especially while working on the LED and photoresistors (I was concerned about damage due to heat transfer from both the soldering iron and the heat shrink gun). I drilled small 1/16″ holes to stick the photo-resistors through, bent the leads, and used electrical tape on the back to help support. I also drilled holes above the speaker, although this box design utilizes the speaker as a monitor and not as the main audio output. I used a small piece of velcro to affix the mylar speaker to the cigar box. I would additionally add a resistor on the LED, so it won’t burn out. My LED burnt out after two days, and I found a good article on Adafruit explaining why. All I needed was to add a simple 250ohm resistor on the negative lead. Both of these items (10k pot and 250ohm resistor) are included on my parts list, for anyone wanting to cook one up.